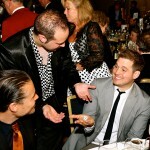 On Friday Michael was delighted to attend this prestigious ceremony for the third year running at the Hilton Park Lane. All of the hottest names in music came out to be part of this special event including Michael Bublé (pictured), Andrew Lloyd Webber, Tom Jones, Kylie Minogue, Jessie J and Emily Sandé. Check out the Gallery page for more photos!